Saudi Aramco’s research and development activities focus on applying its expertise and ingenuity to generate innovative ideas that will make its resources more accessible, useful, sustainable and competitive. Saudi Aramco has laid the groundwork to create sustainable competitive advantage through the introduction of a balanced portfolio of technically feasible and commercially viable technology options. Upstream, it is actively working on technologies that enable greater efficiency in resource discovery and recovery. Downstream research domains seek to develop and implement process improvements and production efficiencies that support its growing petrochemicals business as well as new production and refining efficiencies to reduce costs and support higher value product yields. In addition, its strategic research domains of carbon management and fuel/engine technology pursue the long-term sustainability of crude oil as the preferred energy source in the global marketplace, says Saudi Aramco in its 2014 Annual Review. Achieving breakthroughs that truly move itself and the energy industry forward requires access to the best ideas, people, and partners from around the world. Over the past few years, Saudi Aramco has created a global research network with the establishment of research facilities in targeted innovation hubs in the US, Europe, and Asia. These facilities are fully aligned and integrated with its central research and development organisations and its core businesses. With a global network that spans the world, its scientific research continues literally around the clock. Saudi Aramco continuously strives to leverage its intellectual property (IP) portfolio, practices, and processes to position it as a global technology leader. Saudi Aramco pursues patents in areas where IP protection provides a competitive advantage, global recognition, strategic positioning, and product differentiation. In 2014, its IP strategy yielded significant results. It was granted 99 patents by the US Patent and Trademark Office, the most in a single year in its history, and 154 new patent applications were filed. Beyond helping solve global energy challenges and stimulating the development of the local knowledge economy, its R&D efforts are also aiding the development of the leading Saudi engineers and scientists of tomorrow and fostering the development of the kingdom’s innovation ecosystem. Saudi Aramco is entrusted with the management of some of the largest petroleum reserves on Earth. Achieving the greatest impact for the people who rely on its resources requires it to plan long term for how it can maximise recovery and sustain these resources for future generations. To do so, Saudi Aramco creates and employs some of the most innovative and cutting-edge technologies its industry has to offer. • SmartWater Flooding has the potential to optimise water properties in its carbonate reservoirs to increase recovery. In 2014, a SmartWater Flood demonstration project at North ‘Uthmaniyah resulted in a successful comprehensive formation evaluation at the first observation well of the field pilot. • The front-end engineering and design of cable-deployed electric submersible pumps was completed, with field prototype design, manufacturing, and testing slated for 2015. These pumps are used to boost production rates in offshore fields such as Safaniya. Every percentage increase in recovery rates adds millions of barrels of recoverable oil to its reserves base. Every gain in operating efficiency expands its ability to provide more energy at lower cost. More reserves and longer-lived production mean more energy for opportunities, in Saudi Arabia and for its customers around the globe. Its relentless focus on technology to improve its production value chain, from discovery and recovery to processing and delivery, helps ensure energy stability and economic opportunity. • In 2014, after two years of successful field trials, a new membrane technology to increase NGL production was readied for deployment at its gas plants. Due to their permeability properties, these membranes can block nitrogen and concentrate heavy hydrocarbons in the feed of the cryogenic NGL Recovery Unit, resulting in additional product with competitive economics. • Its carbon management research team completed a demonstration of oxy-combustion of heavy residue with pure oxygen and with enriched air. The technology shows promising results for further scale-up as a means to utilise difficult to burn heavy residues for efficient power generation with the potential for 90 per cent CO2 capture. Establishing and sustaining a global research and technology presence is a key enabler of its drive to achieve leadership across its technology portfolio. Collaborating on a global scale with world-class partners in research domains of strategic importance to it significantly enhances the quality and scope of its research and validates its research directions. This approach provides access to the diverse pools of research talent around the world and allows it to build upon the experience and knowledge of others. Harnessing such intellectual and professional diversity is one of the key sources of innovation and competitiveness. Its global research centres and technology offices represent strategic hubs of innovation and research talent in targeted locations worldwide. 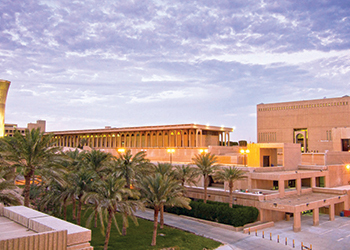 In addition to its in-kingdom research centre at the King Abdullah University of Science and Technology (Kaust), five international research centres and three technology offices continued to grow in scale and scope during 2014, providing support and services to research and technology projects, and enabling innovative research in high-impact, long-term, value-creating domains – all designed to provide it with a substantial competitive advantage. At its Saudi Aramco Research and Development Centre at Kaust, its research complements the strong capabilities provided by the university in downstream areas such as fuel technology. This collaborative relationship is strengthened by its 10-year collaboration (Fuelcom) with the Kaust Clean Combustion Research Centre. Other research areas include catalyst development, materials science, nanotechnology, robotics, and solar energy materials. 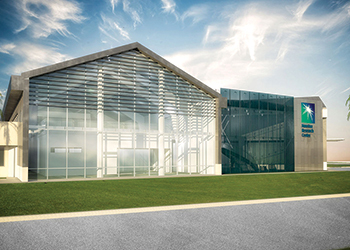 Development of a standalone research facility began in 2014. The new centre will provide space for 150 Saudi Aramco researchers from both the upstream and downstream research domains. Its Aramco Research Centre-Boston is located adjacent to the Massachusetts Institute of Technology (MIT) and was inaugurated in December 2013. Work in Boston supports both the upstream and downstream businesses in the areas of computational modeling, advanced materials, and nanotechnology. In 2014, the Advanced Materials team engaged with the MIT Energy Initiative (MITEI) to pursue research in membrane technology for gas separation and sweetening, materials for heavy hydrocarbon removal, and mesoporous zeolites for crude oil upgrading. 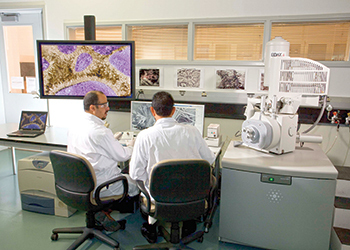 In September 2014, Saudi Aramco inaugurated its largest research centre outside Saudi Arabia. The Aramco Research Centre-Houston focuses on upstream technologies for conventional and unconventional resources to support discovery and recovery goals. Specific areas of research include advanced seismic imaging, unconventional productivity enhancement, smart fluids to improve well productivity, nano-based polymers, surfactants, cement technologies related to drilling operations, quantitative geology, and advanced downhole sensors. The R&D team at its Aramco Research Centre-Detroit focuses on competitive transportation solutions, improving the efficiency of current and future engines, reducing overall environmental impact, cost, and complexity of engine systems. The team engages with original equipment manufacturers and technology providers, matching innovative ideas with real-world production. Areas of research include fuel combustion and emissions, technology integration, and strategic transport studies. Its Aramco Fuel Research Centre-Paris is located at IFP Energies nouvelles (IFPen), a technology provider. This strategic placement allows it to capitalise on IFPen’s facilities and links to various European automakers to accelerate the innovation cycle of different fuel technologies. Areas of research are focused on the development and optimisation of innovative fuel/engine systems. The Delft University of Technology in the Netherlands is home to its Delft Global Research Office. The office focuses mainly on seismic processing and subsurface imaging to help it better understand the nature of its subsurface geology. Its Technology Office in Aberdeen, Scotland, focuses on drilling and production technologies. A recent addition to the office is the newly formed European arm of Saudi Aramco Energy Ventures (SAEV) whose mission is to source and develop relationships with strategically significant and innovative energy technology companies. Its CO2 Management Collaboration at the Korean Advanced Institute of Science and Technology (KAIST) in Daejeon, South Korea, is dedicated to addressing issues related to carbon management. The collaboration follows an interdisciplinary approach to innovative and cost-effective CO2 capture, storage, and conversion from fixed and mobile sources. The latest addition to its global research network is the Beijing Global Research Centre, scheduled to be inaugurated in early 2015. The centre will focus initially on three research areas: geology, geophysics, and production chemicals for enhanced oil recovery. The centre has already made significant achievements in its research into chemical enhanced oil recovery challenges as well as advanced seismic imaging. Complementing its in-house research and amplifying the potential benefits generated by its global research network, SAEV continued in 2014 to invest globally in startup and high-growth companies with technologies of strategic importance to it. Saudi Aramco provided meaningful support to promising companies in the form of strategic guidance, access to its global network, and needed capital to accelerate development and deployment of technologies that are well positioned for growth in the kingdom. With a steady influx of new investments, the focus was on managing its growing venture capital portfolio, enhancing its technology strategy, strengthening SAEV’s operations, and building the SAEV brand. By year-end, 11 investments in upstream oil and gas, downstream operations, chemicals, and energy efficiency were presented to the SAEV Investment Committee for approval. Since its inception in 2012, SAEV has made 13 capital investments. Saudi Aramco knows a good idea can come from anywhere. It is particularly interested in ideas that have the potential to develop into scalable technologies it can leverage to solve the global energy challenges. Through SAEV, Saudi Aramco invested in San Francisco-based Siluria Technologies. Siluria uses a bio-technique to create catalysts that convert natural gas to ethylene. Siluria’s catalytic process results in competitive ethylene manufacturing costs with reduced emissions compared to conventional technology. In addition to the head office in Dhahran, SAEV has established corporate venturing teams in the energy hub cities of Houston, Aberdeen, and Oslo with additional representatives in Seoul and Tokyo. SAEV is maturing into a world-class global corporate venturing organisation that brings investment, economic growth, and new opportunities to its communities. • Strengthen collaborative efforts domestically and internationally Saudi Aramco has established a wide range of collaborative relationships with leading Saudi and international research universities and continue to cultivate additional partnerships. Saudi Aramco is engaged with the King Fahd University of Petroleum and Minerals (KFUPM) in five upstream research areas, including enhanced oil recovery, reservoir quality prediction, near surface seismology, drilling optimisation, and productivity enhancement. Downstream collaboration includes chemicals, sub-quality gas treatment, CO2 capture and utilisation, and oil upgrading. In 2014, Saudi Aramco KFUPM Collaboration Board met to review progress on joint research and development, education, training, technology transfer, and community engagements. KFUPM and Saudi Aramco have a longstanding and multifaceted partnership in education and research. 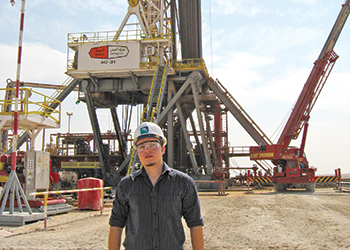 In 2014, the two parties finalised plans to create a new College of Petroleum Engineering and Geosciences at KFUPM, with the mission of providing a world-class, research-intensive education for undergraduate and graduate students, while furthering research in, and the development of, science and technology for the discovery and recovery of petroleum resources. The College, which will benefit from the intellectual and financial contributions of both Saudi Aramco and KFUPM, will serve as a model for innovative and agile approaches to developing centres of excellence in research and education at KFUPM. It will adopt new educational models that bring faculty, students, and industry together to address business and technical problems of importance to the oil industry in the kingdom and globally. The College will provide a collaborative and cross-disciplinary environment where education and research are combined in integrated programmes of significant scope. Its Saudi Aramco-Kaust Collaboration Board met in 2014 to review ongoing collaborative efforts. Saudi Aramco is pursuing upstream and downstream research areas, including geophysics, reservoir engineering, drilling technology, production technology, Red Sea environmental research, fuel combustion, water desalination and reuse, and solar energy. Saudi Aramco is engaged with MIT in an ongoing robust research and education partnership spanning both upstream and downstream business sectors. Its research centre in Boston was strategically located adjacent to the university to foster this strategic relationship. Collaborative research projects with MIT faculty focus on modelling, visualisation, simulation, and advanced materials. Additionally, its Power Systems organisation is leveraging this relationship through sponsorship of a multi-year consortium project entitled "Utility of the Future," which focuses on technical and economic assessment of distributed versus centralised power generation business models. One example of how Saudi Aramco is encouraging collaboration at the nexus of both academia and industry is through its involvement with Dhahran Techno Valley Company (DTVC), a research and innovation park located adjacent to KFUPM and its headquarters in Dhahran. At DTVC, Saudi Aramco is working with KFUPM and leading energy companies to address a number of shared challenges in areas such as advanced materials, geophysics and petroleum engineering, refining and petrochemical processes, water management, energy efficiency, renewable energy, and advanced computing. Commercialising IP is the cornerstone of the leading businesses of tomorrow. Ranking first among Arab countries in globally registered patents and holding some 45 per cent of the total, Saudi Arabia is poised to become a hub of excellence in R&D. Its role in forming the Saudi Arabia Advanced Research Alliance (SAARA) marks a pivotal turning point in this aspiration.